From 1940s women have been wearing the midi skirt and now it has become a must have for all body types. With various styling options, these skirt designs are feminine and blends both modern as well as conservative style. Because of its hemline which lies between the ankle and knees, you can show off your statement shoes. Whether you are short, tall or curvaceous, there is a midi skirt that will flatter your body shape and showcase your style. Pleated midi skirts feature a fitting waist and folds that drape outwards till the hemline. These skirts portray a school girl vibe which can be complemented with socks peeking out of heels. For a fancy look opt for delicate fabrics. Floral Midi skirts are perfect for spring. These skirts are feminine, classy and portray a fun mood. Bold flower patterns should be paired with solid colored tops. A denim long sleeve shirt with black heels can help your floral skirt stand out. What better way to look feminine than by wearing tulle midi skirt. While young women can get away with wearing short tulle skirts, the midi lengths give a conservative yet chic look that works even for older women. Midi pencil skirts feature a design that clings to the waist and legs. These skirts are suitable for office and even formal events. To add volume and create an illusion of a thicker body, pair with slightly loose chiffon tops or vests with ruffles. Lace fabric will always be in style, and you too can go for this fabric by opting for designer lace fabrics. By choosing midi skirts made with famous designers, you are assured you are getting trendy yet quality fabrics that will help showcase your femininity. Want all eyes to be on you this festive season? Then go for a sequin midi skirt. The sparkly material will fit with the Christmas or New Year mood. Add strappy heels to elongate your legs and get glitter French manicure to complete your look. If want your dressing style to be fashion forward, then leather midi skirts are a must have in your wardrobe. Suitable for casual or everyday wear, black leather is elegant and a favorite choice for many women. To emphasize your thin waist, tuck in your top and wear high heels to lengthen your body. 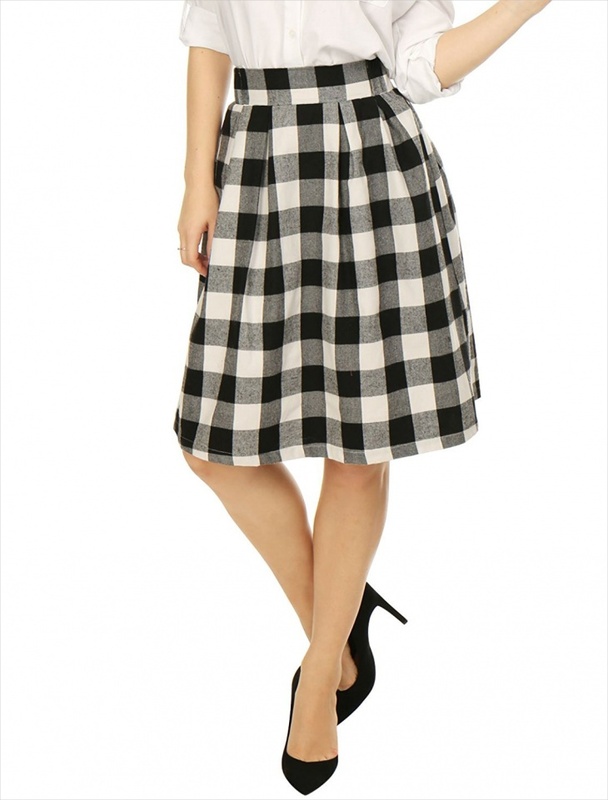 If you don’t have any patterned outfit for fall, then you need a plaid midi skirt. This design gives you a variety of styling options that can help you look girly or classy. A plaid skirt with a lace top exudes a classy look. It is hard not to love denim midi skirts. They are chic and tend to look proper in casual events. A button front denim midi skirt can help show a bit of skin and the design looks great with any feminine top. To complement your denim skirt wear a chiffon top or button down neutral shirt and add a skinny belt. Bodycon midi skirt outfit features fabric that hugs the body from the waist, hips to the legs. For easy movement especially for ladies with an active lifestyle, opt for a design with a front, side or back slit. Tuck your top and pair with platform boots. From pleated, A-line to a circle, skater midi skirts will make any body shape stunning. Young girls can opt for a skater skirt that is slightly below the knees and pair with knee length socks. For a conservative look wear a toned pantyhose or leggings. When you choose vintage midi skirts, you are sure that you are getting one of a kind design. These skirts are suitable for ladies who love outfits from past eras. They make you look modest yet can highlight your personal style. Wrap Midi skirts feature fabric that enfolds the body with a hemline that can either be straight, asymmetrical or circular. 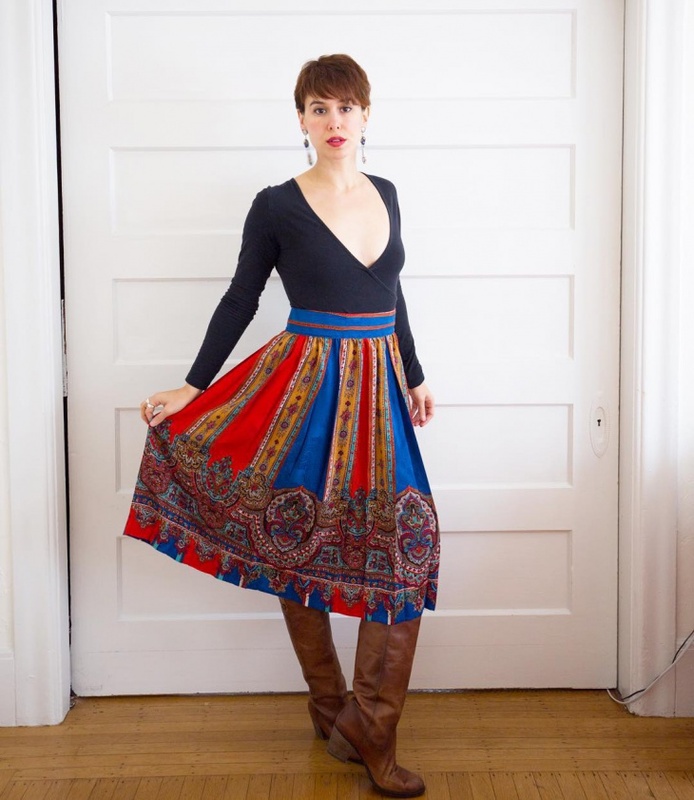 Wear this skirt when going to a fun event, to the beach, mall or restaurant and pair with a chunky sweater. From bodycon, pleated to tulle, midi skirts come in various designs to flatter every body shape. Its silhouette suits ladies of any age and solid colored designs fit professional environments. Just like with maxi dresses, the mid-calf length exudes a conservative look that can be balanced with heels and a fitted top.